Do you need the services of a reliable Locksmith in the Dallas/Forth Worth area? For more than 30 years David Blizzard, owner of Texas Safe & Lock, and his team of certified technicians, have proudly served the Dallas/Fort Worth area with integrity, quality and affordability. Texas Safe & Lock is one of the most progressive, reputable and professional locksmith companies in the Dallas/Forth Worth area. With a wide variety of services ranging from Residential, Commercial, Safes & Vaults, Automotive and 24 hour emergency locksmith service, Texas Safe & Lock is able to cover every locksmith need you may have. Once you experience the professionalism and skill of the Texas Safe & Lock technicians, Texas Safe & Lock will become your locksmith of choice. 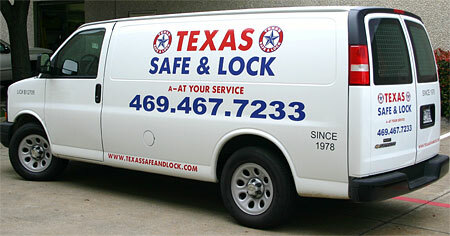 Texas Safe & Lock should be your first and only call for locksmith services.